I did not grow up camping. My first ever camping trip came when I was 19 years old. I was visiting my Uncle Ralph and Aunt Barbara in Southern California. They took this little girl from the Midwest to Pismo Beach. My Uncle and my cousins loved to ride toys in the sand and Pismo was one of their favorite places to camp. Not only did my Aunt and Uncle expose me to RV camping (they taught me how to take a RV Shower) they also exposed me to group camping. I don’t recall exactly how many people were that weekend but it was a decent gathering. I will always remember those RV’s circled in the sand with the waves breaking beyond us and the sound of ATV’s and dune buggies playing in the sand. I found these two photos of my first camping trip. Circa 1990. My task was to dig a hole for the fire that night. My experience driving ATV’s, dirt bikes, dune buggies is minimal. My Uncle let me take an ATV out on the dunes. I pretty much killed it as soon as I was out of sight and spent the next 1/2 hour trying to get it started again. 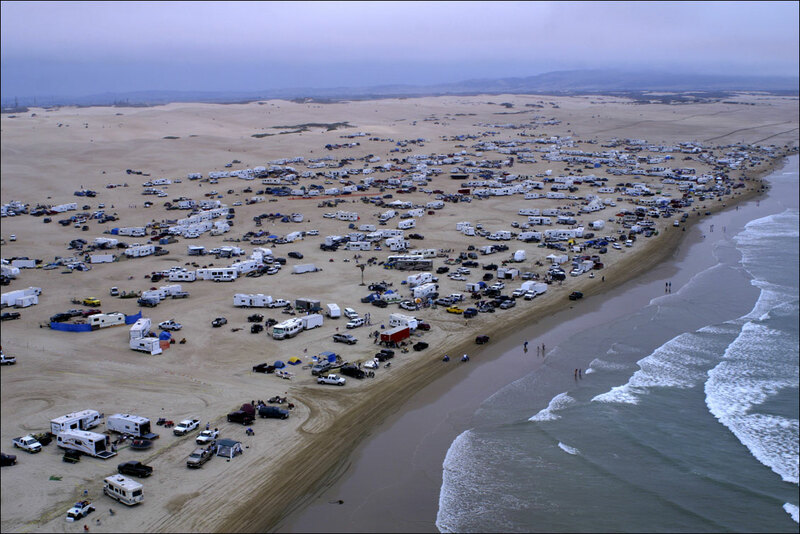 But, hey, I can say I have camped and rode at Pismo Beach. I found the photo below online. I think it does a better job of showing Pismo Beach than my old really out of focus photo. This past summer my Aunt and Uncle drove their Class A back to the Midwest for a visit. They were staying at Crowder State Park outside of Trenton, Missouri and Wayne and I decided to go up and spend the weekend with them on a family site. Last minute we also invited two very dear friends to join us in the camper as The Short Chic decided not to camp with us. The evening was warm, not hot as it commonly is in Missouri in July. Before dinner was served we had a dozen extended family members in the campsite and we were having a some what pot luck dinner. BLT sandwiches with fresh tomatoes, hamburgers, hot dogs, baked beans, deviled eggs, pea salad, lemon bars and fresh chilled watermelon. I am sure my family is like yours, we may not see each other for long periods of time but once we are together the conversation flows so easy. It’s like we were never apart. After dinner I went to do dishes, when I noticed that the water would not drain. The drain was super slow and felt clogged. Later, in the bathroom, I found the bathtub was full of water. The water from the sink had backed up in the bathtub. GROSS!!! Sometime the next morning we realized our grey tanks were full! Remember, we had just gotten Betty back from the dealer where she was being fixed for several small things; one of them a water leak. I guess the dealer ran so much water looking for the leak that they filled the tank. We had no idea! I am not sure why they did not drain it after they fixed it but they did not. Our grey tank normally holds 30 gallons of water and using our external tank we hauled 43 gallons to the dump station! So, here is an RV lesson from Uncle Ralph to you: when your sink won’t drain first look at your tanks. Long after the campground host went to bed we decided to have a campfire. Thankfully the campground host did not mind selling us firewood late at night. Unfortunately, the campfire was interrupted by the tent campers next to us. We were apparently keeping them up as we sat around the campfire talking. The layout of the family site to be odd. There was a picnic table behind our RV’s and one to the right of Uncle Ralph and Aunt Barbara’s. The picnic table behind us was right next to their electric box which meant their tent was so very very close to our campfire. By the end of the weekend, we could feel their frustration as their rolling eyes did not go unnoticed. Saturday morning, as we were leisurely enjoying a cup of coffee, my dear Aunt Deloris showed up with a pan of homemade cinnamon rolls. I am not sure where she found the time to whip those up but they were so yummy I am glad she did! After breakfast, everyone seemed to scatter to do their own thing. We opted to visit the small community of Jamesport MO with Cousin Dennis. Jamesport has a strong Amish community and I love shopping there. We had lunch at our favorite restaurant, The Country Cupboard and went back to the campground for afternoon nap. Well, I napped. Wayne and Cousin Dennis threw some fishing line into the lake at the state park. Saturday evening brought even more relatives to the campground. We had another nine relatives stopping by to enjoy the campfire (which we started way earlier than the night before)! We had found some Mystical Fire powder that made our campfire turn colors and we enjoyed sitting around watching the fire and telling family stories. It was a great weekend spent with family and dear friends. It was the first time Wayne and I went camping without children and the second time we had camper guest outside of our immediate family. We learned weather we are group camping with friends or group camping with family, we are the happiest of campers when we are sharing our downtime with others. On a final note, being able to go camping as an adult with the two people I hold responsible for my love of camping was priceless. Thank you Aunt Ralph and Uncle Barb for spending such awesome time with us while you were back in the Midwest. But most importantly, thank you for cultivating this crazy love for RV’ing and camping in me! That is a great story! We can thank my brother for getting us started only three or so short years ago! He has been camping for over 30 years – from tent, to pop-up, to pull-behind, to 5th wheel. It helped once we sold the lake place – can’t have both. He has one son that now has a 5th wheel. The couple my nephew bought it from liked my nephew and his family so much, they gave them everything inside the camper too! Thank you for sharing your story! I do hope you all get a chance to camp together. Uncle Ralph started off with a van converted to a sleeping van then to a Class C and now has a Class A. I don’t know that we will ever go above a 5th wheel but ya never know!